After taking three of four from the Padres, the Dodgers returned home to face the Angels in another Freeway Series. They got this one off to a good start by mounting a comeback in a 3-2 victory for their third straight win. 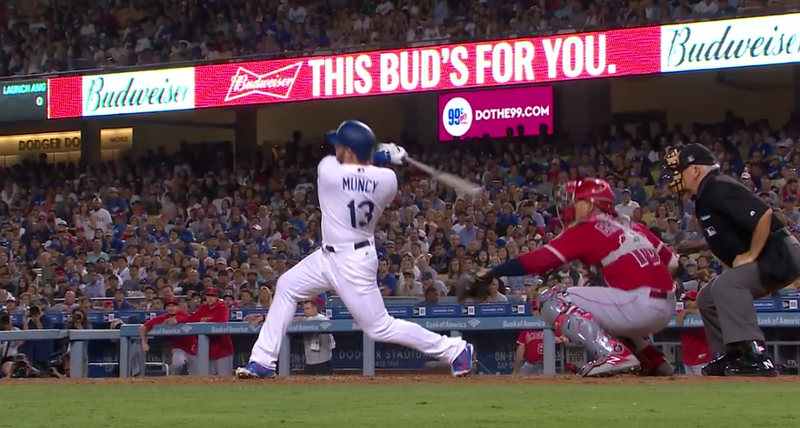 Max Muncy got the Dodgers started right in the 1st, smashing his 22nd dong of the season for a 1-0 lead. They then seemed primed for a big inning after loading bases with one out, but a double play ended those hopes in a hurry. That proved unfortunate, as the offense proceeded to not do a whole lot else in the next five innings, totaling four hits and a walk but getting shutout. Meanwhile, Walker Buehler wasn’t at his sharpest in his first start back from the DL, but he was certainly good enough. He threw 79 pitches and went five innings, giving up two runs on solo shots to Kole Calhoun in the 3rd and 5th. Buehler gave up just four other hits and a walk in his outing, striking out five. Caleb Ferguson took over as the long man out of the pen, and he continued to look like a viable reliever. He twirled two 1-2-3 innings in a row, notching three strikeouts and looking rather dominant. That bought enough time for the bats to finally catch fire in the 7th. Logan Forsythe (of all people) led the rally with a sharp single back up the box, and Joc Pederson followed by yanking a ball past the first baseman for a double to put runners at second and third with nobody out. That brought up Mad Max, and he once again came through with a go-ahead two-run single (with an assist from a ridiculous overthrow) to right center to make it 3-2. Erik Goeddel was then tasked with the 8th as a setup man, and all he had to do was go through the heart of the Angels order. That just seemed to be asking for trouble, and despite any misgivings, he did record a scoreless inning while issuing just a walk. Granted … it was not without concern. With Kenley Jansen unavailable, that left Scott Alexander to close the game out. Hell yeah, baby. After getting one ground out, he then allowed a double and an infield single to put runners on the corners with one out. Thankfully it only took one pitch to end the game, as he induced a 5-4-3 double play, though one that had excitement in it. Woo boy, time to trade for relievers. Scott Alexander, closer. 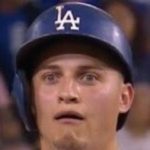 Kenley Jansen dead in a ditch. The Dodgers are now 10 games over .500 on the year at 52-42, though a surprisingly mediocre 27-23 at Dodger Stadium. The win means they maintain their half game advantage in the NL West over the Diamondbacks, who won today as well. Alex Wood will lock up with Andrew Heaney at 1:15 PM HST/4:15 PM PST/7:15 EST on FOX tomorrow afternoon.